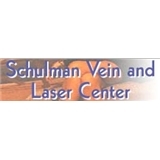 Schulman Vein Center (New York) - Book Appointment Online! The doctors at the SCHULMAN VEIN AND LASER CENTER, Dr. Lee Schulman and Dr. Martin Schulman, are internationally known phlebologists (medical specialists whose practice is limited to diseases of the veins). Our offices are among the few in the United States exclusively devoted to vein disease, and we have over 55 years of combined experience. Techniques we have introduced and developed are now used worldwide. We have presented our work at major international meetings in the fields of venous disease, vascular surgery, plastic surgery and dermatology. At the Schulman Vein And Laser Center, all varicose and spider veins are treated non-surgically, by virtually painless injection therapy sclerotherapy. With this treatment, veins gradually seal shut and disappear. The blood loss and scarring associated with surgery are eliminated. I don't think they were comfortable with Zoc Doc nor showed too much fondness about it.